There are many icons of Mary in Russian Orthodoxy that are considered chudotvornaya, “wonder-working,” “miracle-working.” A peculiarity of some of these icons is that they are believed to “specialize” in treating certain ailments. There is one, for example, to help women in childbirth. There is another believed to be effective in problems of the mind, whether mental infirmity or helping students perform well in their studies. As anyone who has read the group of pious stories known as the Golden Legend knows, the history of saints and images is filled with all kinds of fanciful and imagined and heavily-embroidered stories, and this particular icon goes back to such an imagined story in its Roman Catholic version, which turns out to be quite like the stories one finds in Eastern Orthodoxy about the origins of Marian icons. When it comes to images and paintings of Mary, there is always the frequently encountered tale that this or that image or painting was created by the evangelist Luke. That is in fact the story that became attached to a blackened image of Mary and the Christ Child that was kept in the shrine of Loreto in Italy. Of course such stories have not a wisp of scientific or historical support, but they served to enhance the importance of such images for pilgrims, and were avidly repeated. The original Loreto statue was thus one of quite a number of art works attributed by fancy to St. Luke. And even more enhancing was the story that the chapel in which the Loreto image was kept was the original house of Mary, the same one in which she had met the angel Gabriel at the Annunciation, the same one in which Jesus grew up; and that it had been carried through the air to Italy (with a long pause in Croatia) all the way from Palestine in the 13th century, to avoid its falling into the hands of Saracens (these were the times of the Crusades). The house was said to have been seen by shepherds, carried in the sky by the hands of angels. That is very reminiscent of tales told of icons, such as the appearance of the Tikhvin icon, seen by fishermen as it moved miraculously through the air over a lake in northern Russia toward its destination. To make a long story short, the “Increase of Reason” icon is a painted version of the old, blackened statue of Mary and her child that was kept in the supposed house of Mary in Loreto, Italy. The icon reproduces not only the appearance and garments of the image, but even the shape of the niche with side columns in which the image was kept. That is easy to see when one looks at photos of the Loreto shrine and its image. The present-day Loreto image in Italy, by the way, is a copy of an earlier image destroyed by fire in 1921. At the base of Mary’s garment is a “cherubim” (remember that Slavic uses the plural for the singular in this case). The family name saints at left and right are Svyatuiy Iakov Apostol (Holy Jacob/James the Apostle) and Svyataya Irina Muchenitsa (Holy Irina/Irene the Martyress). The Unburnt Thornbush (Neopalimaya Kupina) icon of Mary is of particular interest because it is so very “pagan” in its notion that a painted icon of divine figures has the power to protect from fire. In old Russia, if a house or building burst into flame, people would stand holding this icon facing the fire in the belief that it would be extinguished. It was also hung to protect dwellings from fire. There is much to say about this type. Its origins are a mixture of references to Old Testament events, to symbolic references to Mary found in the Akathist hymn and canon, and a good portion of it comes simply from apocryphal writings such as the Book of Enoch, and the Book of Jubilees, particularly those portions relating to the angels surrounding the central figure of Mary holding the child Christ (Christ Emmanuel). The immediate reference is to the Burning Bush seen by Moses in the biblical account — a bush that burned but somehow was not consumed. In Eastern Orthodoxy this was and is seen as a prefiguration of Mary, who dogma teaches was pregnant with God (as Jesus) but was not harmed thereby. That is why Mary holds the central position in this rose-shaped form that is like a Jungian mandala. She is in the center with her child; about her are numbers of angels, who are the powers in nature that control such elements as lightning, thunder, and fire. 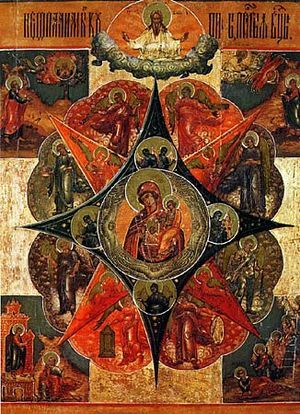 And beyond the rosette, in the four corners of the icon, are four scenes that show noted Old Testament prefigurations of Mary that are also mentioned in the Akathist, the noted hymn to Mary in Eastern Orthodoxy. Moses sees the Burning Bush (Exodus 3:2), shown here with Mary visible in a circle within the flames. Mary was considered to have contained the fire of God, yet was not harmed (this explanation applies also to the separate Ognevidnaya icon depicting Mary with a fiery red face, popular in the 19th century, for which there is no origin story). “And there shall come forth a rod out of the stem of Jesse, and a Branch shall grow out of his roots.” The inscription on that image on the second icon shown on this page reads “A shoot comes forth from the root of Jesse, and the blossom thereof is Christ.” The image depicts Jessie lying down, and on the tree that grows out of him, Christ is depicted. The prophet Ezekiel sees a closed door in the East (Ezekiel 44:1-2), which symbolizes the virginity of Mary in E. Orthodoxy, the closed door to a temple containing the glory of God — the fire of divinity. Moving inward, we next come to the points of the eight-pointed “slava” (“Glory”) representing divine light and the Eighth day of Creation, the Day of Eternity. In the upper left segment is an angel, representing the Evangelist Matthew as a winged man. At upper right is an eagle, representing the Evangelist Mark. At lower left is a lion, representing the Evangelist John, and at lower right is an ox, representing the Evangelist Luke. The most interesting parts of the icon are the angels in the “petals” of the rose, which are usually eight or more in number. They are the forces behind the elements of nature, the hidden powers that control the weather and relate also to the apocalyptic end of the world. Inscriptions describing them vary from icon to icon. And the angel of the presence spake to Moses according to the word of the Lord, saying: Write the complete history of the creation, how in six days the Lord God finished all His works and all that He created, and kept Sabbath on the seventh day and hallowed it for all ages, and appointed it as a sign for all His works. For on the first day He created the heavens which are above and the earth and the waters and all the spirits which serve before him -the angels of the presence, and the angels of sanctification, and the angels [of the spirit of fire and the angels] of the spirit of the winds, and the angels of the spirit of the clouds, and of darkness, and of snow and of hail and of hoar frost, and the angels of the voices and of the thunder and of the lightning, and the angels of the spirits of cold and of heat, and of winter and of spring and of autumn and of summer and of all the spirits of his creatures which are in the heavens and on the earth, (He created) the abysses and the darkness, eventide , and the light, dawn and day, which He hath prepared in the knowledge of his heart. And thereupon we saw His works, and praised Him, and lauded before Him on account of all His works; for seven great works did He create on the first day. One can see that the components of this icon have a great deal to do with fire and burning and lightning, as well as with frost, ice, rain and clouds. When one combines these with the “fire” attributes of Mary, it is not difficult to understand how the belief arose that this icon could control the elements and subdue fire. The central image of the star set upon the angelic rosette is that of Mary holding Christ Emmanuel. She also holds a ladder, symbolizing her position as ladder between heaven and earth, the unifier of heaven and earth through the incarnation. Also often seen is a stone on her breast, signifying the “Stone not cut by human hands” of Daniel 2:45: “Forasmuch as you saw that the stone was cut out of the mountain without hands, and that it broke in pieces the iron, the brass, the clay, the silver and the gold.” This signifies the virgin birth of Jesus from Mary, born without the participation of a human male. Additionally one often sees a small image of Christ as “Great High Priest” upon Mary’s breast, showing him wearing a bishop’s crown. It is common to have an image of God the Father (“Lord Sabaoth” — Gospod’ Savaof)) seen on clouds just above the main rosette. He is usually shown with hands raised in blessing. The icon of the Unburnt Thornbush, because of its supposed ability to protect from and to ward off fire, was very popular in Old Russia, where wooden buildings and dwellings were very common and fire a constant threat. This icon type was particularly popular among the Old Believers. There is a lot of romanticized nonsense written about the painting of icons in old Russia. The fact is that it was a business and a very large business, in spite of sometimes using the euphemism “exchange” for the selling of icons — or more obviously, “to exchange for money.” Huge numbers of icons were sold every year, produced in workshops ranging from large, multi-employee operations to small family or even one-person operations. A good part of icon painting was done by Old Believers, who kept to the old and traditional styles, though some of the workshops — like the one depicted here — could paint in both styles, just as the earlier Cretan workshops in the Greek Islands had produced icons both in the “Byzantine” style and according to Western Roman Catholic taste. The following excerpts are an actual glimpse into a pre-Revolution icon workshop in Russia through the eyes of Maxim Gorkiy, who was apprenticed to one when young. We should not be surprised at the prevalence of drinking and drunkenness at that time, nor should we consider it odd that workers often saw their task of icon painting as a tedious job (which it was), and were sometimes frustrated by the limits that the necessity of being “living copy machines” put on their artistic impulses. As we see, by this time icon painting had become a production-line process, which is one reason for the tremendous output of icon painting studios, even though they were still doing hand work. Gorkiy worked in the icon painting studio at a time when icon painting was beginning to be threatened by lithography on paper and on tin — much less expensive to buy than hand painting — and that caused the icon business to already begin its decline, even years before the Russian Revolution was to cut it back sharply for other reasons. The icon-painting workshop took up two rooms in a large house built partly of stone. One room had three windows, one overlooking the yard and one overlooking the garden; the other room had one window overlooking the garden and another facing the street. These windows were small and square, and their panes, distorted with age, unwillingly admitted the pale diffused light of winter days. Both rooms were closely packed with tables, and at every table sat the bent figures of icon painters. Glass balls full of water were suspended from the ceiling, to reflect the light of the lamps and to throw it upon the square surfaces of the icons in cold, white rays. It was hot and stuffy in the workshop. Here about twenty men worked, icon painters from Palekh, Kholuiy, and Mstera [the three most noted icon-painting villages at that time]. They all sat in cotton shirts with unfastened collars. They had pants made of ticking, and were barefoot, or wore sandals. A boy ruined a girl, and did not care. They sang other melancholy songs, but that was the one they sang most often. Its long, drawn out movement did not keep one from thinking or impede the motion of the fine brush, made of weasel hair, over the surface of the icons, as it painted the lines of a figure and laid fine lines of suffering upon the emaciated faces of the saints. By the windows the chaser, Golovev, worked his little hammer. He was a drunken old man with an enormous blue nose. The lazy flow of song was punctuated by the ceaseless tapping of the hammer, like a worm gnawing at a tree. Some evil genius had divided the work [of icon making] into a long series of actions bereft of beauty and incapable of arousing any love for the business or interest in it. Panfil, the squinting joiner [woodworker], brought the pieces of cypress and lilac-wood of different sizes, which he had planed and glued [the panels on which the icons were painted]. The consumptive [with tuberculosis] lad Davidov laid the colors on. His friend Sorokin painted on the inscription; Milyashin outlined the design from an original with a pencil; old Golovev gilded it and embossed the gold pattern [impressed patterns into the gilded gesso]. The finishers added the landscape [background] and the clothes of the figures; and then they were placed — without faces or hands — against the wall, waiting for the work of the face painter [the worker who did all the visible “flesh,” including the faces of the saints]. It was very weird to see a large icon for an iconostasis, or the doors for an altar, standing against the wall without faces, hands, or feet — just the clerical vestments, or the armor and the short tunics of archangels. These variously-painted panels suggested death; that which should have added life to them was absent, but it seemed as though it had been there but had vanished, leaving only the heavy robes behind. When the features had been painted in by the face painter, the icon was handed to the workman who filled in the design of the chaser. A different workman did the lettering, and the varnish [olifa] was applied by the head workman himself, Ivan Larionovich, a quiet man. He had a gray face; his beard was gray too, the hairs fine and silky. His gray eyes were particularly deep and sad. He had a pleasant smile, but one could not smile at him; he made one feel somehow awkward. He looked like the image of Simeon Stolpnik [Simeon Stylites], just as skinny and emaciated, and his motionless eyes looked far off in the same abstract way, through people and walls. The face painter, Evgeniy Sitanov, succeeded in stunning the maddened creature by hitting him on the head with a small stool…. In spite of his superior place in the workshop, he was less conceited than others, and was kind to the apprentices — me and Pavel. He wanted to teach us the work, since no one else ever bothered about us. He was difficult to fathom. He was not usually cheerful, and sometimes he would work for a whole week in silence, as if mute. He looked at everyone like strangers who amazed him, as if it were the first time he had come across such people. And although very fond of singing, at such times he did not sing, nor even listen to the songs. All the others watched him, winking at one another. “Forerunner” [Predtecha] — what does that mean? Tech, in ancient language, means ‘to go.” A “forerunner” is one who goes before, and that is all” [John the Baptist is called Ioann Predtecha — “John the Forerunner”]. IIn the Eastern Orthodox division of Christianity, which is the primary creator and user of Christian religious icons, there is a very strong emphasis on tradition. But tradition can at times be perilous, and it certainly does not guarantee freedom from error. Eastern Orthodoxy has never been particularly careful about what it chose to accept as tradition, and this is quite obvious in the stories of the saints, which most believers — until very recently — took to be absolutely true, but which are filled with fictions and fantasy. Some saints in the Orthodox calendar never existed, or else their existence has been so distorted and fantasized that they are no longer recognizable. One of quite a number of such errors is seen here: the painting and veneration of icons of a saint called Christopher “Dog-head,” Christopher Kynokephalos. Yes, the people who painted these icons — which were even included in the painters’ manuals — really did believe that there was a saint who had the head of a dog. But to put that in perspective, keep in mind that icons used to have inscriptions dating the time of their painting from the creation of the world, which the icon painters (and the rest of the Church) believed took place only some 7,000 years ago. That tradition, held for about as long as Eastern Orthodoxy has had a formal dogmatic proclamation authorizing the veneration and making of icons and cursing those who refuse to accept them, has now been quietly retired, except among very conservative Eastern Orthodox, including no doubt many Old Believers. And though icons of St. Christopher “Dog-head” were painted and venerated in both the Russian and Greek branches of the church, and of course instructions were found in painters’ manuals, one does not generally see new icons of this saint being painted today, or even old ones being venerated in the churches. This saint — in this form — has also been quietly retired, because some traditions do come back to bite you. There were stories of dog-headed men in early pre-Christian Greek writings, so it is not surprising that when people read that there was a saint from the land of dog-headed men whose name was Christopher (Khristophoros = “Bearer of Christ”), they assumed that he was one of an odd race at the edge of the world, and that he — a soldier — had been converted to Christianity. The “dog-headed men” in these old stories — at least when referring to Africa — may have actually been baboons, which the Greeks later called “Dog-headed Ones” (kynokephaloi). Other early accounts place dog-headed men in India as well. Christians accepted the existence of dog-headed men as part of the supposed “knowledge” of the time. On Cyprus at a much later date, another tradition developed, saying that Christopher was not born with a dog’s head. Instead, he was such a strikingly handsome youth that women were always after him. Wanting to avoid temptation, Christopher prayed to God, who in answer to the prayer changed his head to that of a dog. As is common, this summary states that there is no connection between Christopher and Greco-Roman depictions of the Egyptian jackal-headed god Anubis. Perhaps. But the resemblance to icons of Christopher is nonetheless remarkable, and there are many blank spots in his history. In the “modernizing” reign of Peter the Great, the “Holy Synod” censored the painting of icons of Christopher Dog-head in Russia in 1722, but as with the earlier Stoglav proclamation against painting icons of God the Father (Gospod’ Savaof), it was often ignored in everyday practice, particularly by the Old Believers who did not accept rulings of the State Church, and by those painting icons for the Old Believers. People saw no need to stop doing what had long been done, because in Orthodoxy tradition is very important. In Russian icons, Christopher’s head sometimes tends to look more like that of a horse than the more dog-like depictions favored in Greek icons. Was there ever a real “Christopher,” under any name, with or without a dog’s head? It hardly matters, because the story is so distorted by time and imagination that any real person who may have been behind it has been submerged in hagiography to the point of oblivion. It is often the case that there is little or no difference between Eastern Orthodox traditions and folk tales. Each holds a cross of martyrdom. The two border saints are Ekaterina (Catherine) and Marfa (Martha). Christ blesses from the clouds above. Icons depicting the dog-headed St. Christopher together with Sophia and her daughters are surprisingly frequent. The reason for this is said to be that to the Old Believers, these saints signified persistence and perseverance in the face of persecution and torment, and Christopher also was believed to protect against sudden death. So it was common for an icon combining these saints to be found as a family patronal icon among Old Believers. The forbidding of the dog-headed Christopher by the “Holy Synod” in 1722 only confirmed the Old Believers in their notion that the persecuting State Church was on the side of the Antichrist, and so they clung to icons of Christopher “Dog-head” even more firmly, and continued to paint and venerate them even as they faded away in State Church iconography. As one might expect, most modern depictions of Christopher in State Church Eastern Orthodoxy depict him as a normal-looking human, dressed as a Roman soldier. One Russian blog (in Russian) gives an interesting modern reader’s story about Christopher “Dog-head.” *A customer went into the big “Sofrino” store that is operated by the Russian Orthodox Church under the Patriarchate of Moscow. Sofrino sells all kinds of Russian Orthodox Church supplies, including icons. The man requested an icon of St. Christopher painted in the old style, with a dog’s head. The clerk replied that the image was uncanonical, forbidden by the Holy Synod in the 18th century. The customer countered by saying that the Council of 1971 (under the Moscow Patriarchate) abolished all restrictions on the Old Ritualist (Old Believer) canons and icons, and lifted the anathema on the Old Belief. He added that the old-style images of Christopher were still to be found in many local Orthodox Churches. The third time he was called and came thither, and found a child beside the rivage of the river, which prayed him goodly to bear him over the water. And then Christopher lifted up the child on his shoulders, and took his staff, and entered into the river for to pass. And the water of the river arose and swelled more and more: and the child was heavy as lead, and alway as he went farther the water increased and grew more, and the child more and more waxed heavy, insomuch that Christopher had great anguish and was afeard to be drowned. And when he was escaped with great pain, and passed the water, and set the child aground, he said to the child: Child, thou hast put me in great peril; thou weighest almost as I had all the world upon me, I might bear no greater burden. And the child answered: Christopher, marvel thee nothing, for thou hast not only borne all the world upon thee, but thou hast borne him that created and made all the world, upon thy shoulders. I am Jesus Christ the king, to whom thou servest in this work. And because that thou know that I say to be the truth, set thy staff in the earth by thy house, and thou shalt see to-morn that it shall bear flowers and fruit, and anon he vanished from his eyes. And then Christopher set his staff in the earth, and when he arose on the morn, he found his staff like a palmier bearing flowers, leaves and dates. This motif of Christopher carrying the Christ Child who becomes heavier is Arne-Thompson Folk Motif #768. Now interestingly, this motif of a man carrying someone who grows heavier and heavier across a river is found in the much earlier ancient Greek episode of Jason and the goddess Hera. In it, Jason is traveling homeward. On the way he comes to the River Anauros, where he finds an old woman wanting to cross, but no one will carry her. Jason takes her on his back, and steps into the water. But as he crosses, the old woman (who is Hera in disguise) becomes very heavy, and Jason loses a sandal in the river (a key plot point of the story that results in his search for the Golden Fleece). Christopher was considered the patron saint of travelers. Those of you who are old enough to remember the 1960s may recall the fad among the “surfer” crowd and others for wearing the little round colorful silver and enamel St. Christopher medals. These are now collector’s items. St. Christopher was removed from the Roman Catholic calendar of saints in 1969, but he is still found as “Great Martyr Christopher” in the Eastern Orthodox Church Calendar, on May 9th. Eastern Orthodoxy has never had a Reformation; Eastern Orthodoxy has never had a rational review of its catalog of saints. That accounts for the numbers of mythical saints long painted in icons and still found in the Church Calendar today, saints venerated even though their reality is equivalent to that of Goldilocks and the Three Bears. According to the accepted story, these seven youths were all friends who had grown up together in the city of Ephesus, and all had become soldiers in the Roman army and were Christians, even though this was in the time of the Emperor Decius, who persecuted Christians. The Seven youths refused to sacrifice to the Roman gods, and to avoid punishment they hid out in a cave on a mountain. The Emperor, learning of their hideout, ordered it blocked up with stones. All this is said to have happened in the middle of the 3rd century. Here is where the “miracle” comes in. The seven youths fell into a strange sleep, and they slept not for a few hours or days or weeks or months; they slept for almost two hundred years. In the time of the Emperor Theodosius the Younger, who lived in the first half of the 5th century, certain “heretics” appeared at Ephesus saying that the resurrection of the body was not possible. Meanwhile, a certain man had decided to construct a building on the mountain where the long-forgotten youths lay asleep. He had stones removed from the entrance to the cave. At this time the youths awoke out of their two-century-long sleep, and one of them, Iamblicus, was sent into the city to buy some bread. When he got there, he was amazed to see a cross on the gates of the city, and further surprised to hear people openly talking of Jesus. When Iamblicus found a place to buy bread, he paid for it with a coin bearing the image of the Emperor Decius, a two-hundred-year-old coin. The seller considered this very suspicious, and soon the youth was accused of hiding a treasure of old coins somewhere. He was taken before the governor and the bishop, and the bishop, realizing that there was something mysterious here, went with the youth to the cave where his companions were waiting. The story got around, and even the Emperor came to the cave and talked with the young men. But then the youths lay down and went back to sleep again in the cave, this time until the resurrection, which supposedly had been proved possible by their first sleep. Now as one can tell, the logic of this tale is somewhat skewed, and it is a simple piece of folklore, recorded at least as early as the 6th century (it is found in the writings of the Syrian bishop Jacob of Serugh, c. 451-521). One wonders why it is still put forward as the “Gospel truth” in Eastern Orthodoxy, where the Seven Sleepers can still be painted and venerated in icons, when their story has no more validity as history than that of Rip van Winkle, to whom a similar thing happened in the Catskill Mountains of New York. tree, he sat under its shade to rest a bit. So it is a very old motif, recycled in Christian hagiography. Candida Moss says of such fanciful “lives of saints” (in her book The Myth of Persecution; how early Christians invented a story of Martyrdom, Harper One, 2013) that “The fact of the matter is that these aren’t historical accounts; they are religious romances written and intended to be read for moral instruction and entertainment.” It is unfortunate that Eastern Orthodoxy does not inform its laity that much of what they read in the lives of the early saints is not history at all, but rather religious fiction, and that many of the saints depicted in icons either never existed at all or have had their stories heavily embroidered with non-historical elements. Максимилиан, Иамвлих, Мартиниан, Иоанн, Дионисий, Ексакустодиан (Константин) и Антонин — Iamvlikh, Martinian, Ioann, Dionisiy, Eksakustodian (Konstantin), and Antonin — Maximilian, Iamblicus, Martinian, John, Dionysius, Exacustodian (Constantine) and Antoninus. Four patron saints of the person who owned the icon are shown in the borders of the image. The one at upper left is the “Angel Khranitel,” the Guardian Angel, a generic figure in icons who represents the angel guarding every believer. Finally, here are the Seven Sleepers in a fresco at the Dionysiou Monastery on Mt. Athos, in Greece. Their names, given in the Greek form, are from left: Maximianos, Iamblikhos, Martinianos, Dionysios, Antoninos, Exakostoudianos, and Konstantinos. Dec 02 / Nov 19: Venerables Barlaam and loasaph, Prince of India, and Saint Abenner the King, father of St. loasaph (4th c.). The interesting thing about that entry is that Ioasaph/Ioasaf, Prince of India, is actually the Buddha. Yes, you read correctly: the Buddha. The Eastern Orthodox Church annually commemorates the Buddha in their calendar of saints. Of course the reason for this is that until relatively recently, no one in Eastern Orthodoxy knew that Ioasaph was the Buddha. But that is the inescapable conclusion of scholars who have studied the matter, and the reason for it turns out to have been rather simple. In early times, Buddhist missionaries were found on parts of the trade route extending from the West all the way to India. And so stories of the life of the Buddha became spread here and there, and one of those stories — the story of the Buddha’s early life — came West. It is the tale of a young Prince of India who decides to renounce his wealth and power for the spiritual life. When Christians encountered this tale, it became distorted into the story of a Prince of India who renounced his wealth and power for Christianity, and that, in brief, is how the Buddha came to be a Christian saint commemorated in the Eastern Orthodox calendar. The name “Ioasaph” — also found as Ioasaf, Joasaph and Josaphat — is simply a garbled version of the word “Bodhisattva” — the title applied to the Buddha before his enlightenment. The identity becomes more clear if one sees the Arabic intermediate forms Budasaf and Iudasaf. Barlaam — written as “Varlaam” on Russian icons — was a pious hermit who counseled Ioasaph. The story of Barlaam and Ioasaph in Greek was once attributed to the 7th century John of Damascus (the big supporter of icon veneration), but apparently the core was actually transmitted earlier through Manichaean writings on the trade route. A christianized version comes from the Balavariani, a 10th century Georgian epic; Euthymios of Athos, a Georgian monk, translated the story into Greek in the early 11th century. It can be traced back through an Arabic version to early Sanskrit Mahayana texts recounting the life of the Buddha. In its Greek version — the one still considered “history” by countless Orthodox believers — it is called The Precious Pearl. In the Western church, the two saints are called Barlaam and Josaphat. Eastern Orthodoxy has a very strong attachment to tradition (one of the chief sources, in fact, of its doctrines and lore of saints and icons), but it has never had a clear boundary between higher and lower traditions, nor has it ever been particularly careful or scrupulous about actually checking the veracity of those traditions, as this one out of many examples illustrates. As one person on the Internet remarked concerning this mistaking of the Buddha for a Christian saint, “Saint….OOPS!” Eastern Orthodox bookstores still sell the life of Sts. Varlaam and Ioasaph. Those who want a more detailed account of the transmission and transformation of the story of the Buddha into that of a Christian saint will want to read the book In Search of the Christian Buddha: How an Asian Sage Became a Medieval Saint, by Donald S. Lopez Jr. and Peggy McCracken, W.W. Norton & Co, 2014. The image at the top of this posting shows Varlaam at left, holding a scroll reading, “I declare to you, child, the priceless pearl which is Christ….” (the Greek manuscript of the tale of Varlaam and Ioasaph is titled The Precious Pearl). Iosaph is at right. This icon depicts the Prophet Jeremiah — or does it? It is a quite a few centuries too late to be pointing it out (and it was somewhat dangerous to point it out when the doctrine of icons was being formed in Eastern Orthodoxy), but there is an inherent flaw in the in whole matter — the formal rationale for icon painting. The catch here is the word “likeness.” People in the time of John of Damascus thought they had a true image of Jesus passed down from his lifetime (the so-called “Abgar” image), but today we know better. The fact is that in ancient times no one had the slightest idea what Jesus looked like. Moreover, the earliest Christians did not show much interest in the matter, and certainly no interest whatsoever in the making and venerating of icons. The earliest depictions of Jesus in the catacombs show him as a generic, beardless young man, often holding a magician’s wand as he works a miracle. The image of Jesus developed and evolved over time until finally it settled into certain characteristics, so that when one looks today at an icon of Jesus, one recognizes it; but what one recognizes is not “Jesus,” but rather the conventionalized image of Jesus that the Church eventually created. The same can be said for the icon images of huge numbers of saints. No one really has the slightest idea what many of them looked like, except for a very few and often late saints, such as Seraphim of Sarov, who lived in the 19th century. There were other Russian saints who either had icons painted from their dead bodies or from the scant descriptions of contemporaries, but the great bulk of Eastern Orthodox saints in icons are merely conventionalized images that developed over time and eventually became recorded in icon painters’ manuals with their conventional characteristics. One recognizes saints — for the most part — not by their facial features, which are often generic, but rather by the cut of the hair and beard, the type of garment, and other such representative elements.We can say, in fact, that the majority of icon saints are constructed by assembling these elements according to the patterns that have come to be traditional. Of course no one knows what Jeremiah looked like. But one does know the codes that developed in iconography. So Jeremiah is a combination of the conventional characteristics of certain “model” saints like John the Theologian (the apostle and evangelist John) and the prophet Elijah. But again, no one really knew or knows what those two model saints looked like. 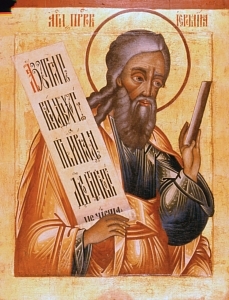 So here we have Jeremiah from the Stroganov manual: He is assembled from generic elements: a generic robe, the generic hair style used for the prophet Elijah, the generic beard used for the Evangelist John, generic face and feet, generic halo, generic scroll, with one of two suggested inscriptions, though inscriptions often vary and the colors of the garments often vary as well from manual to manual and icon to icon. What we have here, then, is an abstraction, nothing that was ever actually in human flesh. The final (and really very important) touch on such an icon abstraction is the title, which in this case would be “The Holy Prophet Jeremiah.” The title is really the chief identifying factor for a great many icon saints, because so many saints are so generic in appearance and so much alike that without the title is difficult or impossible to identify them. One can see, then, that icon painting in reality is considerably different than the propaganda for it in “popular” icon books and icon sites would lead one to believe. It is said in such books that icons try to depict “invisible reality” in visible form. Well, try as one might, that is an impossibility. One is left with the material elements of board and gesso ground and egg tempera paints and gold leaf, and all are very material elements that can only create material subjects, no matter how beautiful or skillful such depictions may turn out to be. All the rest is provided by the human mind and imagination.